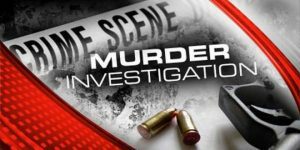 Police say they are investigating the murder of a farmer at Port Kaituma, North West District. Dead is 67-year old Dennis Williams of Canal Bank,Port Kaituma. Investigators said Williams was allegedly killed by his 36 year-old son-in-law. He has been arrested and is assisting with the investigation. Enquiries disclosed that about 3 AM Saturda morning the suspect and two friends were consuming alcohol outside of the suspect’s home; the suspect later allowed the men to sleep in his house . Police said the wife and daughter of the suspect later ventured out to use the washroom and the suspect accused the wife of leaving to see his friends. “He began beating his wife who started screaming and her father (Williams) who resides in close proximity ,crossed the river with his boat ,rescued and remained with her until the break of day. About 06:30h the deceased was returning home in his boat when shortly after the suspect entered a boat powered by an outboard engine and in “a fit of rage”, drove over the deceased and his boat causing him to fall overboard and submerged.